Readers of the works of Blessed Columba Marmion, O.S.B., know firsthand the riches he spreads before us — a veritable banquet of the mystical life, rooted in Sacred Scripture and the Church’s traditional liturgy. Relatively few, however, are aware of his disciples and the correspondence he conducted with men and women throughout the world, especially religious men and women who turned to him for spiritual direction at a distance. 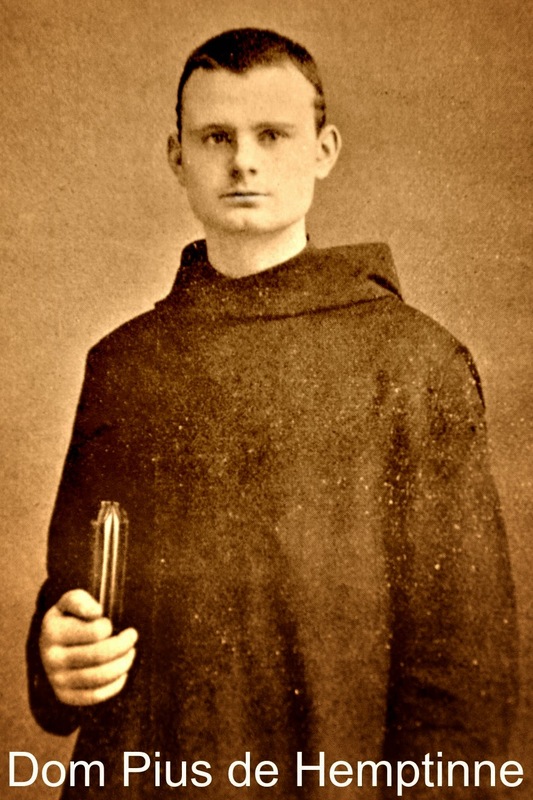 One of these disciples was a monk, Dom Pius de Hemptinne, O.S.B. (1879–1907), who left behind precious spiritual writings of his own. In keeping with the purpose of my occasional “Classics of the Liturgical Movement” series, I would like to share with NLM readers some excerpts from the writings of Dom Pius, who gives expression to a profoundly Benedictine fusion of liturgy, personal prayer, and the whole of life, including the message of the natural world. In this way he illuminates and encourages us to live ever more deeply the meaning of the sacred mysteries. All excerpts are drawn from A Disciple of Dom Marmion, Dom Pius de Hemptinne: Letters and Spiritual Writings, trans. Benedictines of Teignmouth (London: Sands & Co., 1935). The death of a God, dying for the salvation of men, is the central point in the history of mankind. All ages bear witness to and converge towards it: the preceing centuries point to its coming, the others are destined to harvest its fruits. The death of Christ is the centre of history, and also the centre of the life of each man in particular. In the eyes of God every man will be great in proportion as he takes part in that deed; for the only true and eternal dignity is that belonging to the divine Priest. The degree of each one’s holiness will be in exact proportion as he participates in that bloody immolation. For the Lamb of God alone is holy. But although Jesus Christ the divine High Priest appeared only once on earth, to offer up His great sacrifice on Calvary; yet, every day He appears in the person of each one of His ministers, to renew His sacrifice on the altar. In every altar, then, Calvary is seen: every altar becomes an august place, the Holy of holies, the source of all holiness. Thither all must go to seek Life, and thither all must continually return, as to the source of God’s mercies. Those who are the Master’s privileged ones, never leave this holy place, but there they “find a dwelling,” near to the altar, so that they never need go far from it; such are monks, whose first care it is to raise temples worthy to contain altars. Making their home by the Sanctuary, they consecrate their life to the divine worship, and every day sees them grouped around the altar for the holy sacrifice. This is the event of the day, the centre to which the Hours, like the centuries, all converge: some as Hours of preparation and awaiting in the recollection of the divine praise — these begin with Lauds and Prime continued by Terce, the third Hour of the day; the others, Sext, None, Vespers, and Compline, flow on in the joys of thanksgiving until sunset when the monks chant the closing in of night. Jesus Christ is the great Master of souls. He nourishes them with His Flesh, His Blood and His whole Self. He really makes Himself their Food. And, just so, it seems to me that no one receives the care of souls without taking upon himself the duty of feeding them with his own self. We must give ourselves up to the souls put in our charge, with such fullness of love that the grace given to our own souls shall overflow into theirs. We shall meet, perhaps, with souls that are famished, weak or wounded: little souls that throw themselves on to us, and would fain feed from us with too great avidity and familiarity. Such conduct will wound us, as it wounds Jesus Christ. But after His example we must feed these poor sheep, in order that they may recover strength and life. Most holy and eternal Father, your divine Son has taught us that no one can come to Him unless you draw him, and that none shall be lost of those whom you have given Him. I beg of you, therefore, in the name of the mutual love you bear to Him and He to you, to offer me and all whom I love to this divine Son, begotten of you, so that being born again in Him, your Word, we may have a share in the eternal glory which He gives to you, and that we may thus be sanctified in you. Eternal Son, whose holiness is equal to that of the Father, you have promised that “when lifted up from the earth, you would draw all to yourself.” Draw me, then, to you, O well-beloved of my soul, that being fed by you I may live by you, even as you live by your Father. Holy Spirit, who descended upon the Virgin to accomplish the mystery of the Incarnation of the Word, come down upon me, O joy of my heart and strength of my soul! Impregnate me, to the end that Jesus Christ may grow in me, so that by your power, the closest union may be effected between my Saviour and my poor soul, inflamed by your love. Labour is preceded and followed by rest; rest restores the strength and fits it for fresh effort. So it ought to be with the soul of the monk. His work is divine praise; his rest is prayer. In the first, he sings to God; in the second, he reposes in Him; first celebrating the object of its love, and then giving itself up to the caresses of that Love whom it adores. In that solemn prayer, the soul like a soaring eagle gives a few strokes with its wings, but soon rests in prayer and lets itself be borne on the impetus of grace.